Suicide bombers attack UNIMAID again – Royal Times of Nigeria. 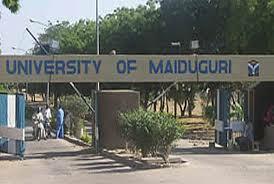 Two suicide bombers on Thursday night attacked the University of Maiduguri (UNIMAID). A security guard and a soldier were killed after a twin bomb blast occurred in the university five days ago. It was gathered that an explosion was heard in the school premises at about 11pm while another bomber detonated at about 12am. The Student Union Government, SUG President, Abu Hanifa Babati, confirming the attacks said the first attack occurred around the Faculty of Veterinary Medicine, after the bomber detonated the bomb before being accosted by soldiers. He said the second explosion occurred around a female hostel called BOT. Victor Isuku, the spokesperson of the Borno police command, has also confirmed the attack on the university. He said in a statement; “On 18/5/2017 at about 2350hrs, three male suicide bombers with IEDs strapped to their bodies, gained entry into the premises of university of Maiduguri,”. “In an attempt to enter the female hostels, they were intercepted by security operatives. One of the bombers hurriedly detonated his IED vest, killing himself instantly.